Another outfit? Different make up? Change your hair? No problem, you have the time to try out everything. Some people go very fast, some other need a litle bit more time. 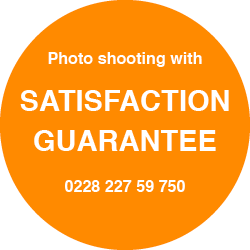 I am ready to take all the time it needs to make you look perfectly on your photos. So after all such an portrait shooting will last around 1-2 hours. All photos are sent while the shooting directly to the computer, so you can see the results on the monitor in big format. You can judge the results on the fly, make decisions for any changes or proceed to the final selection of the perfect photos. You will not take any risks. Just come and tryout if you will find here the headshot photo of yourself. If for any reason you are not satisfied with the results of the photo shooting, there will be no charges. You pay only for photos that you really like! Try it out now – without any risk! A spe­cial look, some beauty retou­ching or adapting the digital files for a CMYC offset print? Pro­fes­sional retou­ching brings the last tweak to your photo. Even very indi­vi­dual pro­jects can be rea­lized based on my photos or on your photos or a mix­ture of both. For many of us who do not feel like a model, the way to the pho­to­gra­pher is like the way to the den­tist. But the good news is that in my studio you will not get hurt. Even more – I guess I can make almost ever­y­body feel com­for­table in my photo studio where you will find a like­able working atmosphere. If you wish, we can fix appointments beyond office hours in the eve­ning or in the week end. The important thing is that you make sure to choose a date when you are not stressed, when you are not under time pres­sure and ide­ally when you are yoursel in a crea­tive mood.